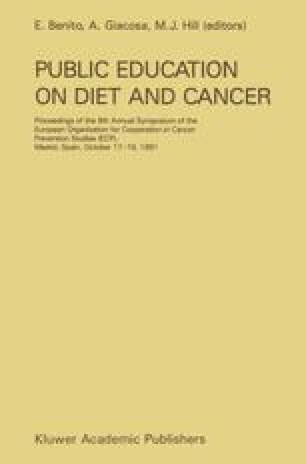 Epidemiological studies have demonstrated that alcohol interacts with tobacco smoke in the development of cancers of oral cavity, pharynx and oesophagus (Blot et al., 1988; Ferraroni et al., 1989; IARC, 1988; La Vecchia et al., 1986; Tuyns et al., 1988; Tuyns et al., 1977). How the effects of alcohol result in increased risk for cancer of different sites is not well understood and several mechanisms can be envisaged (IARC, 1988; Doll and Peto, 1981; Fraumeni, 1979; McCoy and Wynder, 1979; Tuyns, 1979). Firstly, alcohol may function as a solvent, thus facilitating the passage of carcinogens through cellular membranes. This mechanism, however, does not explain increase in cancer risk in body areas which do not come into direct contact with it. Secondly, ethanol consumption leads to an enhancement in the liver drug-metabolising capability in both humans and experimental animals and may, therefore, activate carcinogenic substances. In this particular mechanism, it remains to explain the reason for the high site-specificity of the alcohol effect, since all tissues in the body would be exposed to the results of changes in liver metabolism. Conversely, after the onset of alcohol-induced cirrhosis, a decreased ability to detoxify carcinogens may cause an increase in their systemic concentration. Furthermore, ethanol consumption may alter intracellular metabolism of the epithelial cells at the target site. Such impairment of cellular function (i.e. decreased mitochondria) function, increased DNA alkylation, etc) can be aggravated by the coexistence of nutritional deficiencies (including niacin, riboflavin, iron, etc) (Day, 1984; Darby et al., 1975; Decarli et al., 1987; Li et al., 1989; Lu et al., 1985; McLaughlin et al., 1988; Rossing et al., 1989; Van Rensburg, 1986; Wahrendorf et al., 1989). Finally, it must not be overlooked that the concentration of ethanol attained in humans at least in the upper digestive tract can cause local irritation.